Offered by the United States Mint as one of three different coins of a series is the 2013 5-Star Generals Commemorative Silver Dollar Coin. This strike is issued along with a $5 gold coin and a clad half-dollar coin in the US Mint's 5-Star Generals Commemorative Coin Program. Shown on the obverse of this silver dollar are portraits of two 5-Star Army Generals - George C. Marshall and Dwight D. Eisenhower. Their likenesses are placed in front of a striped background and the 5-star insignia appears above their heads. Both individuals attended and taught at the United States Army Command and General Staff College (CGSC) in Fort Leavenworth, Kansas. That distinction is one of the reasons they are being honored on this series of coins as surcharges raised by the sale of the strikes is to be forwarded to the CGSC Foundation to aid in its support of the college. This surcharge will amount to $10 per silver dollar as directed by the authorizing legislation for the series - 5-Star Generals Commemorative Coin Act – Public Law 111-262. The obverse of this silver dollar depicts the likenesses of George C. Marshall and Dwight D. Eisenhower in front of a striped background with the 5-star insignia above them. The design was completed by US Mint AIP Master Designer Richard Masters with sculpting to be completed by US Mint Sculptor-Engraver Joseph Menna. Obverse inscriptions include GEORGE C. MARSHALL, DWIGHT D. EISENHOWER, IN GOD WE TRUST, 2013 and LIBERTY. 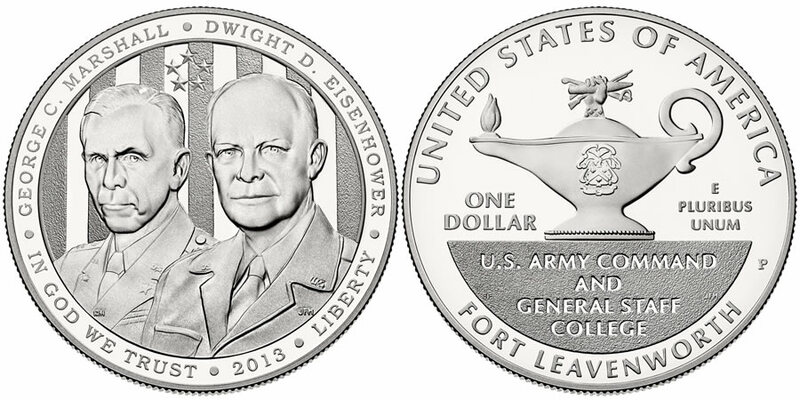 The reverse of the coin offers a depiction of the Leavenworth Lamp, a symbol of the Command and General Staff College. The reverse was designed by US Mint AIP Master Designer Barbara Fox and United States Mint Sculptor-Engraver Joseph Menna will sculpt.